The coming together of Jack Bruce, Ginger Baker and Eric Clapton in 1966 as Cream not only saw the first instance of what swiftly became known as a supergroup, but it was also the first widely popular rock power trio, beating the likes of The Jimi Hendrix Experience and Taste by a matter of weeks. The power trio would prove to be a format that would become increasingly popular in the years that followed, with bands like Groundhogs – who actually existed before Cream – Blue Cheer, Budgie, Beck Bogert & Appice, ZZ Top and many, many others taking the format on into the ’70s and beyond. One such trio was UK psychedelic hard rock band Gun, formed in 1967 by guitarist Paul Gurvitz (then known as Curtis), who previous to their 1968 worldwide hit Race With The Devil and subsequent two albums were a larger unit, once famously and briefly including Jon Anderson in the line up. The Yes connection continued, as Gun’s self-titled debut album was illustrated by Roger Dean’s first foray into LP cover art. The version of the band that released records was whittled down to a trio, with Paul Gurvitz on bass guitar, joined by his brother Adrian on lead and rhythm guitar and Louie Farrell on drums. Gun disbanded after unsuccessful attempts to follow up the hit single, and the brothers briefly went their own ways before reconvening in 1971 as Three Man Army, initially a studio-only project due to other commitments, and ironically without a permanent drummer, rather giving the lie to the name! The punchy band name was reflected in the music, which saw a stylistic shift into the then nascent hard rock sound, as exemplified by contemporaries Budgie, but sweetened by a pop sensibility. The psychedelic embellishments of yore were trimmed right down but not completely shorn, as evidenced by the kaleidoscopic ending to Another Day, probably my favourite track from A Third Of A Lifetime. Largely though, the paisley was replaced by denim, the band pursuing a melodic yet tough rocking sound. In the post-Gun period Adrian had worked with Buddy Miles, and he appears as a guest drummer on the opening track, offering a typically muscular backing. Buddy Miles also contributes organ to the laid back funk rock of Midnight and bass to the fearsome wah-fest of Nice One. Mike Kellie, on a short sabbatical from Spooky Tooth, who seven or so years later turned up on the drum stool for the fabulous post-punk band The Only Ones is the drummer for the rest of the album, and his percussive flair shines through on Another Day and on Midnight, the gloriously clear mix of this particularly fine remaster highlighting every subtlety of Kellie’s highly musical style. As with Gun, Adrian Gurvitz writes almost everything for Three Man Army and A Third Of A Lifetime opens with Butter Queen, a song that nails the brothers’ new sound to the floor, it being a fast paced hard rocker that rattles the ornaments in exemplary fashion. Butter Queen, along with the Groundhogs-like sleazy wah-funk of Nice One and the dramatic rhythmic syncopations of See What I Took are ’70s rock classics…I wonder if he wrote them in an attic*? It’s not all hard rockin’, they did slower songs too, in my humble opinion better than their Welsh contemporaries Budgie, leaders of the UK pack in early ’70s power trio hard rock, but a band whose slow songs sound like the album fillers they were. The romantic instrumental title track here includes a neat string arrangement presaging Adrian’s later forays into the pop market. The pop arrangements Adrian has a knack for are also highlighted on the band anthem Three Man Army, and on Agent Man which both come across as a combination of Slade balladry and early ELO with added guitar wizardry, and both written before either of those bands had got into their stride. Closing with the reflective and latterly joyously charging and symphonic Together, hinting at the musical changes that were afoot in 1971, this is a fine album that does not trap itself into a corner of patchouli scented leather jacketed rocking, as was the case with a lot of similarly structured bands of the time, which is maybe why it didn’t sell in the quantities it certainly deserved to. 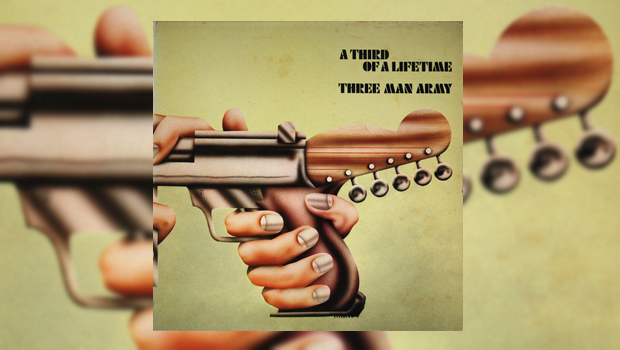 Three Man Army eventually became a proper touring band a year or so after this debut, when Adrian’s previous commitments with Buddy Miles had been fulfilled, with renowned tub thumper Tony Newman moving into the drum seat. They recorded two more albums – a third album of unreleased material came out in 2005 – and went on to have moderate success in Europe, and Germany in particular, but the gap between the first album to becoming a touring band meant that impetus was lost here in the UK and they never amounted to anything in their homeland. This was a shame as I consider them to have been at least on a par with their contemporaries, and it took Adrian’s meeting up with Ginger Baker while in the States with Buddy Miles prior to the recording of A Third Of A Lifetime, a meeting that would eventually lead to the formation of the Baker Gurvitz Army, for the brothers to achieve the albeit short-lived level of success that their undoubted talents deserved.